Repel dogs, cats, rabbits, rats, mice and other creatures. The Bird-X YardGard is ideal for yards, gardens, porches, buildings, greenhouses and many more. The YardGard uses powerful sonic and ultrasonic sound to repel dogs, cats, rabbits, rodent pests and other creatures. The built-in infrared motion sensor activates YardGard when pests move into its coverage zone. Alternatively, YardGard can be set to operate continuously to create a permanent “no-go” zone. LARGE COVERAGE. Coverage area up to 4000 square feet. ADJUSTABLE FREQUENCY. Powerful sonic and ultrasonic sound can be selected depending on the pest. FLEXIBLE. Continuous or motion-sensor operation allows flexible use. CONTINUOUS PROTECTION. 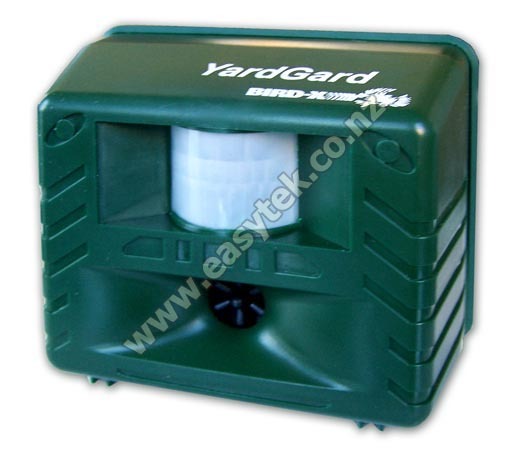 YardGard is an effective pest repeller and animal deterrent that works day and night. WEATHERPROOF. The snap-on rain cover protects controls. EASY MOUNTING. Mount anywhere with keyhole slots. ENVIRONMENTALLY FRIENDLY. Does not harm the environment or the animal pests. DUAL OPERATION. AC adaptor and batteries provide reliable and flexible power supply options. 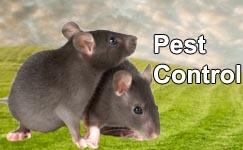 Pests: Dogs, cats, deer, rabbits, rodents (rats and mice) and other house and garden pests. Uses: Use in yards, lawns, gardens, porches, buildings, greenhouses and more. YardGard reviewed by Louise B., Auckland on 2015-12-15 . The purchase was based on previous purchase which had been successful. I feel the quality has slipped since my brother bought the original unit. Comments	Yard guard was bought to replace old unit bought by my brother years ago. New unit, back cover didn't fit well and holes in back were exactly the same so had to use old cover. Also the switch for power or battery was reversed. So had to set to battery to use power! Took a while to figure this out! It is working which we are happy about. YardGard reviewed by Colin H., Christchurch on 2015-11-12 . YardGard reviewed by Will P. on 2014-09-16 . The product clearly isn't working. Your response to my query has been good but you are avoiding the real issue. I seem to have got a bad one but I can't fault your defence. It's your business. YardGard reviewed by CHOOI F NG on 2014-09-16 . YardGard reviewed by Lyn B. on 2014-08-29 . I was delighted to receive advice over the phone and be able to place an order by phone. YardGard reviewed by Robert . on 2013-08-23 . YardGard reviewed by Karen q. on 2013-08-01 . YardGard reviewed by Mike L. on 2012-09-17 .